The Imbible: A Spirited History of Drinking The Musical Comedy sweeps audiences along a 10,000-year journey across the globe accompanied by craft cocktails and live musical performances. Save $15 with this coupon: Save $15 on each individual ticket by going to Telechargeoffers.com and using code IECTYGD15. 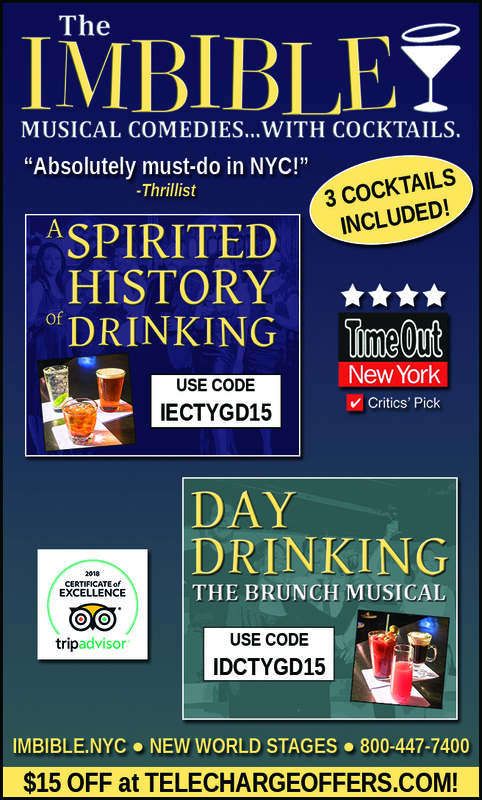 Or, for the weekend alternative Day Drinking The Brunch Musical (2pm Saturday, 3pm Sunday), use code IDCTYGD15 at telechargeoffers.com to get $15 off each ticket. Click here for the coupon code. For more information, visit imbible.nyc.